Kakuro is a puzzle in which maths and logic meet. It is as interesting and challenging as Sudoku but with an added mathematical element. The puzzles come in a range of different grid sizes, so you can choose one for a quick coffee-break challenge or an intense brain workout! 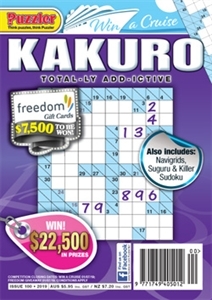 Kakuro contains a complete Unique Digits Table, an essential aid for all Kakuro solvers, plus a variety of other logical puzzles such as Killer Sudoku, Loop-The-Loop and Suko.